A company called Tombot thinks it’s come up with a way to improve the quality of life for seniors facing challenges when it comes to being social: a robotic companion dog that behaves and responds like a real pup, but without all the responsibilities of maintaining a living, breathing animal. The company even enlisted the talented folks at the Jim Henson’s Creature Shop to help make the robo-dog look as lifelike as possible. It’s a noble effort, but it also raises lots of questions. For starters, can robots actually be a good substitute for an animal companion? Replacing people with robots is a massive technological challenge—and one we’re not even close to accomplishing. Every time a multi-million dollar humanoid robot like Boston Dynamics’ ATLAS takes a nasty spill, we’re reminded that they’re nowhere near ready to interact with the average consumer. But robotic animals are a different story. It’s hard not to draw comparisons to a well-trained dog when seeing Boston Dynamics’ SpotMini in action. And even though it still comes with a price tag that soars to hundreds of thousands of dollars, there are robotic pets available on the other end of the affordability spectrum. Sony’s Aibo, originally released 20 years ago, was so popular and beloved that owners in Japan regularly held funerals for their robo-dogs when they stopped working and replacement parts were no longer available. In late 2017, Sony brought its Aibo line back from the dead, and despite a $2,900 price tag and questionable smarts, it’s hard not to get drawn into interacting with the plastic pet as if it were a real puppy. But Tombot isn’t the first company to create a robotic pet specifically designed to serve as an attentive companion. For the past decade, a $5,000 robotic seal called Paro has been comforting seniors and those dealing with longtime illnesses like Alzheimer’s. And a few years ago Hasbro introduced a ~$100 robotic cat and dog under its Joy For All line (which has since spun off into its own company called Ageless Innovation) that will respond lovingly to (or at least appear to) physical interactions. As long as you don’t need a robotic pet to fetch the paper, scare off intruders, or retrieve dead ducks, robots can effectively deliver at least some of the interactions and companionship a real-life pet can. Can Tombot actually deliver the next-generation of robotic companion pets? Enlisting experts like the Jim Henson’s Creature Shop’s Creative Supervisor Peter Brooke and Animatronic Supervisor John Criswell was a good start. In addition to designing over-the-top muppets, the studio has created life-like animatronic animals for use in movies and TV, and with a deep understanding of how creatures move, they were able to deliver a design for a robotic dog that not only looks more like a real dog than a plush toy, it moves like one as well. But there’s a big step between designing a convincing robotic dog, and actually delivering one to consumers. The Creature Shop’s animatronics are usually designed to function for brief performances on set, or in a theme park setting where power cables, pneumatics, and other support structures can be easily hidden from cameras or audiences. Tombot’s robo-dog needs to be completely self-contained, run on batteries, and survive interactions with users who might not always be gentle with it. The company is bringing its robo-dog to consumers through a crowdfunding campaign on Kickstarter that’s already reached its modest $20,000 funding goal, but there are still plenty of risks. The company is targeting a retail price of $500, which could be considered optimistic given Sony’s new Aibo will set you back $2,900. By comparison, Tombot’s creation isn’t as mobile or feature-packed as Aibo is, but there can be many unforeseen costs and problems that arise when a product moves into production, even for a corporate behemoth like Sony. Tombot’s promised delivery of August 2020 is still a long way’s off, so they have time for a few hiccups along the way, but reaching its funding goal already doesn’t mean it’s going to be smooth sailing from here on out. And finally, there’s the bigger question of using robotic animals to comfort the sick or elderly. Like sitting an over-active child in front of the TV to quiet them down, in some way it feels like cheating the responsibilities of caring for parents and grandparents in their later years. But the reality is that there simply won’t be enough caregivers to give elderly baby-boomers in nursing homes and long-term care facilities the attention and social interactions they may need—and robots can potentially fill that void. At CES 2019, a robot called Elli-Q was introduced as a companion for seniors that allowed them to access content on smartphones and tablets using easy voice commands, but it also provides conversational interactions; even initiating discussions with someone living alone. However, those smarts come with a $1,500 price tag. 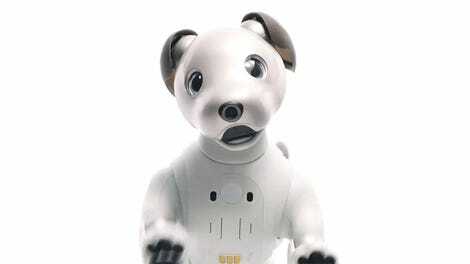 Tombot’s robo-dog does respond to basic voice commands, but by focusing on believable responses to physical interactions, it remains relatively inexpensive as far as advanced robots go. 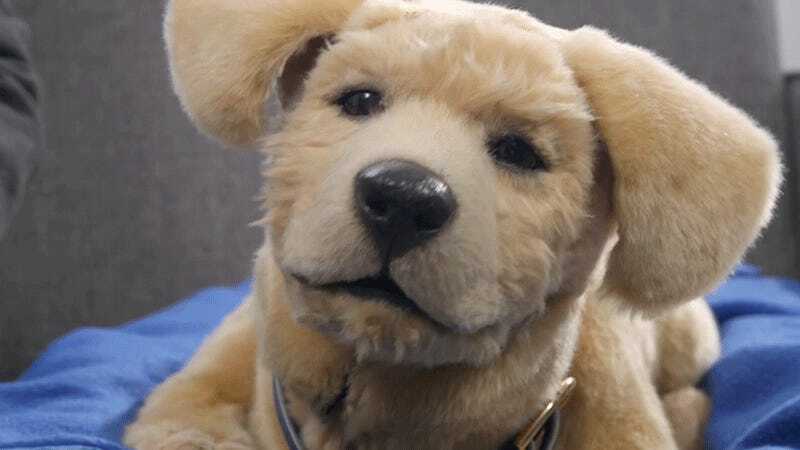 It’s not going to fool anyone into thinking it’s a real dog, but just based on how soothing videos of Tombot’s creation are, it’s not hard to believe that it could provide lots of comfort to someone in need.